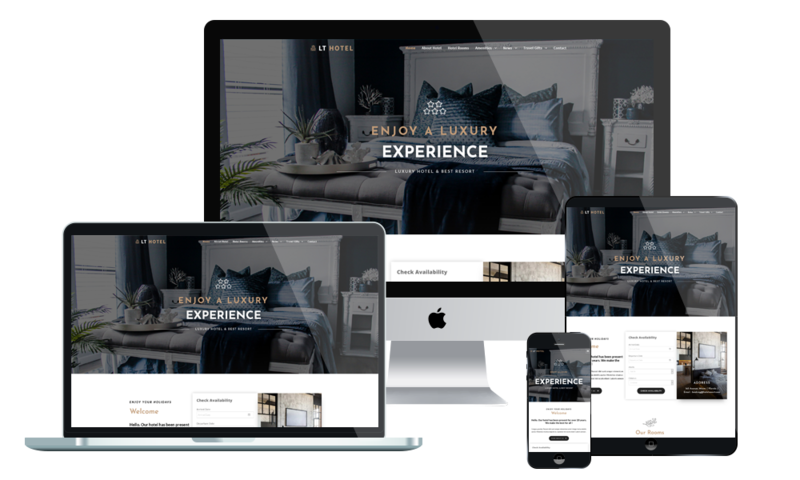 LT Hotel is a premium and free WordPress theme used for responsive hotels and resorts websites. This luxurious theme comes with a royal and elegant design that is very suitable to present the services, promote the marketing and establish a brand for your hotel. It is packed with features that hotel website might need such as a services section, special event, promotional prices, etc. LT Hotel supports fully responsive layouts to ensure your website looks great on any screen size of all mobile devices. In addition, it comes with lots of really useful built-in features such as strong shortcode, drag-drop layout content, Bootstrap CSS & Hybrid framework… ready to help you easily customize the design and give your website that unique look. Amazing website can attract more visitors and increase your bookings. One of the condition that a strong hotel must have is brilliant teamworks. This page will help you introduce your customers to find out any needed information about your staff from their profile to their professional field. This page brings you to present the types of room which your hotel currently has, such as single room or double room. Especially, customers can learn and choose the best service package. Portfolio page showcases gallery about famous rooms with a nice view of the hotel for your customers. We offer luxurious designs in an eye-catching manner for portfolio page. Customers could be easy to find out the address, phone number, or fax number of your hotel through this page. With the separated tabs, they could figure out any needed information about your hotel. By the map on this site, customers also determine your hotels location and send the feedback to management department just a click.